It’s happened again. As if I needed another reminder of the lesson I keep learning: never, ever give up on finding the elusive answer to a research question. It must be eight years since I first discovered the move that Georgiana’s parents made with their young family just before they went to live in newly built Crosby Lodge. I still don’t know why David Kennedy decided to leave Carlisle and live for more than a year at a place called Ennom/Ennim bank. I found letters from that time addressed to him there and also found the record for Georgiana’s younger sister Mary, baptised locally at Dacre parish church. I can only guess that Kennedy fell out with his mother-in-law (whose home the Kennedys had been sharing since their marriage several years earlier) or that he wanted to escape the town for a more rural lifestyle. Whatever the reason, there were still a few unanswered questions. 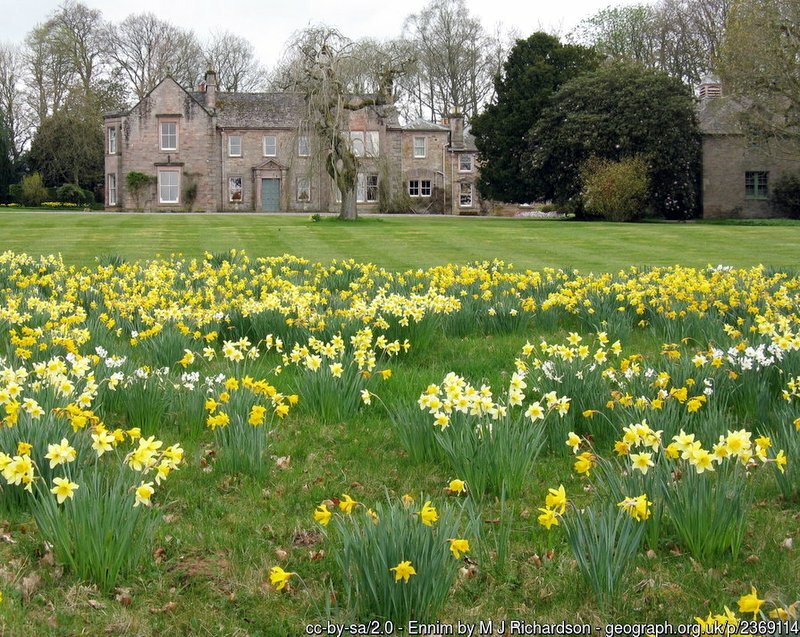 It didn’t take long to find out that a large house called ‘Ennim’ was owned by one William Troutbeck. Georgiana mentioned his son, George, several times in her letters from Australia and it’s clear that she believed for a while he was interested in marrying her. (George was ten years older and the son of a landowner, gentry like her own father, so it would’ve been an ideal match but she thought he took far too long to propose.) What I couldn’t find was the proof that ‘Ennim’ was the same property as ‘Ennim Bank’ where the Kennedys were living. I wondered whether they had simply moved into William Troutbeck’s large, elegant country home as his guests or perhaps they were renting a smaller house or a farm on his land. For years, I’d searched on old maps and trawled through hundreds of Internet listings. I found a few references to ‘Ennim Bank’ but nothing that proved whether it was the same building as ‘Ennim’, the large house. Yesterday, something I wasn’t even looking for popped up in one of my online searches, a reference to the Troutbeck family of Cumberland, and it reminded me that there was still a mystery I hadn’t solved. I decided to try once again because the Internet is constantly growing and refreshing, and because ‘you never know…’ And what I was looking for just appeared before my eyes, an old map, dated from around the turn of the twentieth century, with the big house at Ennim clearly labelled as ‘Ennimbank’. Now I know where Georgiana lived for about a year from around the time she was learning to walk. I can look at photographs of the house knowing it’s the same building mentioned in David Kennedy’s letters and an old real estate listing still lingering on a website even allows me to see the rooms inside. Like so many of the places Georgiana called home, the setting is rural, wild and beautiful. I know because I went to the nearest village, Great Blencowe, on one of many walking holidays in the Lake District, many years ago. Closer to Penrith than Carlisle, it must surely be the place where her first clear memories of gardens and hills were made. George Troutbeck was the son of William Troutbeck and Charlotte Busby. He was baptised on 4 Aug 1795 and died just five years after Georgiana in June 1848. In Western Australia, Georgiana heard he had married Eliza Stephenson and told her mother in a letter that she wished them well and hoped they’d be as happy as she was, married to John Molloy. George and Eliza had two sons. In 1841, the Troutbecks were still living in considerable comfort at Ennim Bank with five house servants, a land manager and an agricultural labourer. George spent money on improvements to the house, new plantations and landscaping the grounds. In 1811, when he was sixteen, George became an ensign (the lowest officer rank) in the Penrith Local Militia and in 1844 he qualified as a magistrate in Carlisle, but apart from those events his life appears to have been unremarkable. Would Georgiana have enjoyed the rural simplicity of that way of living? We’ll never know but we can be thankful that her decisions brought her to us here in Western Australia and that life offered her the challenges that led her to becoming the skilled, meticulous botanical collector we know her as today. It feels very strange to even think that, if George hadn’t dragged his feet quite so long in proposing marriage to young Georgiana Kennedy, this mansion would have been her home – and I would never have written ‘The Mind That Shines’! http://georgianamolloy.com/wp-content/uploads/2018/08/Ennim-Bank-001.jpg 275 800 Bernice Barry Bernice Barry2018-08-02 17:20:462018-10-27 14:44:25Research? Never give up.